I love to have fun with my wedding clients and, as you look at the pictures on this web site, you’ll see that brides, grooms, brides maids and groomsmen have fun spending time with me. Sure, I’ll do some traditional poses on your wedding day but I also try to capture the true spirit and emotions of your friends and family. This is a perfect example of one of those wedding photos. This shot was taken right outside the front door of the Hyatt Regency Long Island at The Wind Watch Golf Club in Hauppauge, New York. The groom and his ushers were waiting outside for the reveal: when the groom would see his bride in her wedding gown for the first time. I put a very expensive wide angle lens on my Nikon camera, had the guys huddle around me, and laid on the ground shooting up at the crazy group. 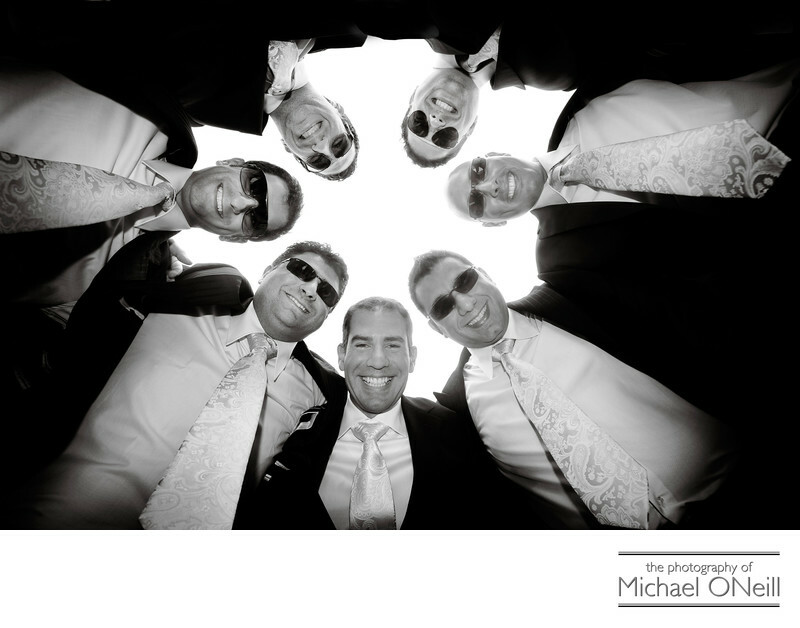 Looking for a different, more contemporary, fun feeling in your wedding pictures? Give me a call. I’m your man.